Raise your hand if you have ever played games on your Visor during a meeting. Who hasn't? While playing Zap!2016 on your Prism will get you caught for sure, it's a great time waster for those lulls we face in life. Zap!2016 is essentially a version of Zap!2000 that has been optimized for the 16-bit color of the Visor Prism. Shoot the bad guys and get powerups along the way, and every once in a while you go up against a boss. Your mission -- should you choose to accept it -- is, er, um, shoot everything in sight. 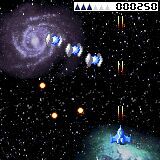 I couldn't find a background story, but basically Zap!2016 is your typical space shoot'em up. Waves of enemies come down (and sometimes up) at you. Shoot an entire wave to collect coins that get you extra points. Sometimes a medic ship comes by that you can shoot to get weapon powerups. Besides your main laser weapon (which can be set to automatic if you register), you also can colect sheilds and nukes to help you out. The game sounds are actually pretty good because the Prism's speaker is louder and are a great way to annoy your significant other. 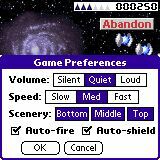 You can adjust the Speed of the game if it's too hard for you (wimp), and can also adjust the Scenery if the game ever has any slowdown. I never had any problems with slowdown in the game, and Zap!2016 actually played more smoothly than Zap!2000 on the Prism. The default button configuration (shown) actually works out pretty well, and since you can adjust the controls, Zap!2016 is GameFace-ready.